If Bristow has a female equivalent it is surely Miss Sunman. Labouring daily in the depths of the typing pool, she is clearly not attractive (though the dubious accolade of ugliest woman in the firm is proudly held by Bessie Bland) and whilst the other girls can hope to marry and leave, Miss Sunman seems destined to stay forever. She is often found wandering round the building gossiping or collecting for leaving presents. She has, perhaps, blossomed just a little over the years. Here is how she first appeared, with ragged hair, big nose and sinister smile. And those horrible glasses. Apart from the floral print dresses, there has definitely been some sort of make-over. it seems clear who is making the running. Ah, Valentine's Day. If she can't get off with someone at the Xmas Dinner & Dance then she can always dream of a card from a secret admirer. 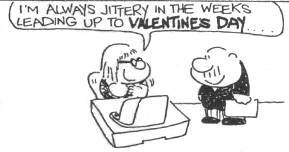 If she does actually get a Valentine then it is probably from Jones making it look like Bristow's writing. Or the other way round. Miss Sunman has yet to receive a genuine Valentine. Astonishingly, she finally does get off with someone at the Dinner and Dance, as shown on Frank Dickens website in January 2007, but alas, it is with a man who can't say "no" - one T Thompson. Sadly one must suspect that for him it was just another night's toadying. Despite her romantic inclinations toward him, Miss Sunman has no illusions about Bristow. When she is updating the holiday schedule and Bristow loftily tells her to check first with Fudge she replies that she already did and he can be spared anytime.